We should not try to make it harder for people to communicate. We should work together and stop this destructive tradition of languages that forces people apart. A couple of days ago I had a discussion about language. I mentioned how annoyed I was that a Danish newspaper constantly translated perfectly fine words like 'tablet' into some strange Danish equivalent. In Danish, a tablet is called a 'tavle computer'. It is not just a terribly long word that is impossible to fit into any UI, it's also the wrong word. A 'tavle' is a blackboard. A 'bræt' (in Danish) would be a tablet. Why do countries spend so much time translating perfectly fine words into something that makes no sense of all? A long time ago in a place far, far away, we used to all live in the same place. And since everyone was living in the same place we also all spoke the same language. When someone discovered a fancy new thing, he would name it a 'gobbledygook' and everyone else would agree that this new thing was indeed a gobble..dy...ehm...what kind of duck? A gobbledygook, he would repeat and everyone would now understand and nod enthusiastically. But as time progressed and we started to expand into this strange land over the horizon, the distance between us also increase to the point where we could no longer communicate efficiently. One day a person was walking through a valley in a land far away from anyone else, and she found this yellow root with green leaves on top of it. She cautiously took a bite, like it very much, and decided to hence forth call it a 'carrot'. Why did she call it a carrot? Well, the person who found it was called Caroline, and it was a root. 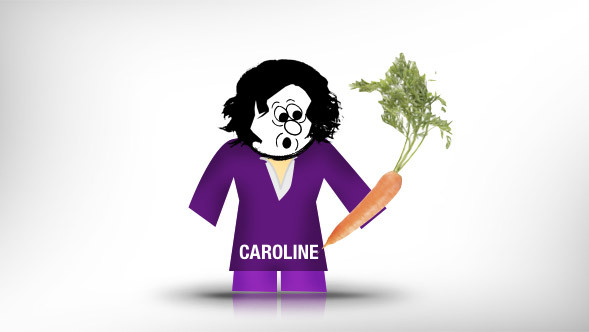 Carrot. It makes perfect sense (and yes, I made that up). In another valley, very far away from Carolin, a man was walking down a path when he tripped over a yellow root like thing with green leaves on the top. He tasted it, and, being slightly annoyed by his throbbing toe, he decided to call it a 'morot'. Meanwhile, in another valley, a group of friends were out playing in the sun, when one of them noticed this yellow thing sticking out of the dirt. He picked it up and immediately had allergic reaction and sneezed ...Marchew!! All his friends looked up, noticed this strange thing he was holding in his hand and immediately decided, mostly to tease him, that it was indeed a 'marchew'. Everything was fine, and we all started eating strange yellow things that stick out of the ground. Quite a while later, these three people happened to meet at a big convention of troubadours. Being very polite people, one of them wanted to offer the others a quick snack. He reached into his bag and said, "would you like a morot?" Everyone looked at him in horror. That is not a morot. It is a marchew. Caroline was fuming, and many other people came over to see what all the fuzz was about. Each one immediate claimed that it was a wortel, a kök, an azenario, a pastanaga, a porgand, a cenoria, a lobak merah and many other variations. The whole convention ended pretty badly, and people rushed home to tell how awful everyone else was. They put up big fences around their lands to keep the others out, which resulted in country borders, immigration control, and quite a number of wars against those 'other people' who believe differently. I am, of course, just making a joke out of it. But the point is very serious. The reason why we have language today and use two different words for the same thing, is not because that is a good thing. It is a limitation of the past that prevented us from communicating efficiently with other people. Local languages are a problem, not a solution. I find it odd when countries and politicians insists that we preserve local languages. We now live in the connected world, and whenever someone discovers something new, we should use the original word that the person created, instead making up our own. Just think if the economic consequences that local languages have on society. Every person, everywhere, needs to communicate globally by default. But because of the language barriers, kids today have to spend years in school learning that a morot in Sweden is a carrot in England. What if we instead of language classes had communication classes. Instead of learning different words for the same thing, we would spend our time learning how to use the same words more efficiently. Communication is essential in the connected world, but no kid today learn how to write an engaging blog post. And the impact for businesses, of course, is even worse. The amount of money that goes into localizing websites and apps is astonishing. And that is not even the worst part of it. One of the reasons why newspapers in Sweden are struggling in the global world, while the Economist is not, is simply that the Economist, written in English, can be read by billions, while a Swedish newspaper are confined to only people who thinks a newspaper should be called a "tidning". What's worse is all the people who say that their language is part of their tradition. It is, but it is not a good tradition. It is based on the idea that just because you use a different word for something, you are worth more than other people who call it something else. That is a form of racism. A tablet should be called a tablet, and people should not try to make up their own words for it. And a Kuaizi should be called a Kuaizi. This is the connected world.